The first Chinese dish I ever ate was Almond Boneless Chicken or War Su Gai. Living here in Michigan I never gave it much thought, until we traveled beyond the borders of our lovely state. Apparently, this Chinese dish is fairly exclusive to the Michigan area. Who’d have thunk? Living here all my life, I admit I have been spoiled. Every Chinese restaurant I’ve ever gone to offers this wonderfully mild dish with a savory gravy and tender chicken. Still, never satisfied with just “buying” a meal, I had to figure out how to make this dish at home. For years I fumbled around in the kitchen, experimenting with recipes, failing, trying again, and finally coming up with a combination of recipes that comes pretty close to one of my favorite carry-out Chinese dishes. Sprinkle chicken with salt and pepper, drizzle with sherry and marinate for 15 minutes. Prepare batter. Combine all ingredients in small bowl and beat with a fork until well combined. Make gravy. Heat 1 1/2 Tbsp. oil in wok or large skillet over medium heat. Add celery and stir fry 2-3 minutes. Add mushrooms, water chestnuts and bamboo shoots and stir fry 3-5 minutes. Add chicken broth, soy sauce, oyster sauce, salt and sugar. Bring to a boil and cook 7 minutes. (At this point I strain out the vegetables, but if you like, these can be kept in the gravy.) Return strained gravy to wok and return to boil. Stir in cornstarch slurry and cook until thickened. Turn heat to low and keep warm. Fry chicken: Heat oil in deep fryer or wok to 350. Dip chicken pieces in batter, letting excess drip off. Fry until golden brown 7 – 10 minutes, turning once. Remove from oil and drain on paper towels. Serve over white rice and top with green onions and almonds. Note: Serving this with the green onions sprinkled on top really makes a big difference. Although the gravy and chicken are flavorful, the onion really makes it pop. Knowing how to make this dish at home means one less meal we have to eat out, although I do admit I do enjoy getting Chinese food above all others when going out to eat. Being that mine is still not “exactly” like the restaurants though, I can still order and enjoy it each and every time, and for this I am — Simply Grateful. 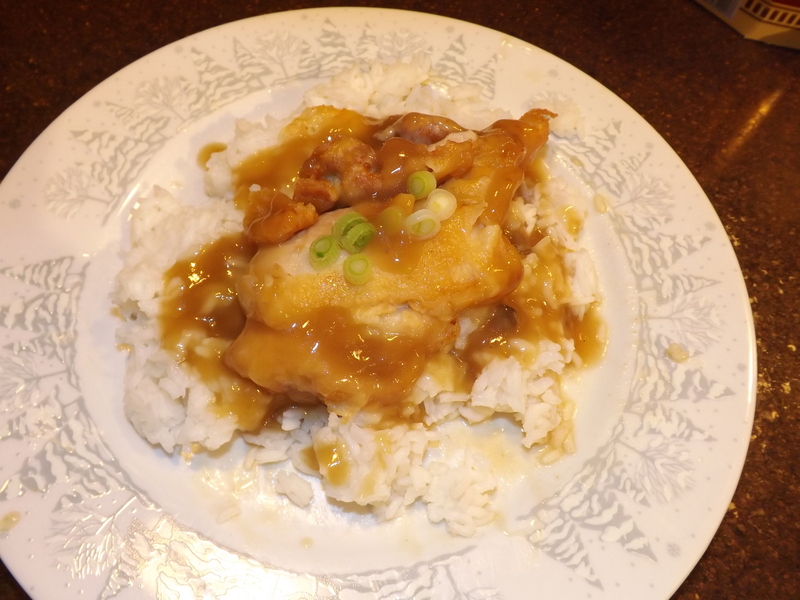 Update 2/6/16: Check out an update on gravy variations at Simply Grateful Cooking, https://simplygratefulcooking.wordpress.com/2016/02/06/almond-boneless-chicken-the-gravy-debate/.